Enjoy the popular modern look in your bathroom with this beautiful vanity. The white artificial stone counter and brown fiberboard base make this piece great for any bathroom. The double-door cabinet and drawers are great for putting away bathroom items. Make your bathroom look like new with this good-looking, useful set from Wyndham Collection. For some added modern style in your bathroom, choose this beautiful vanity. With a white artificial stone counter and brown fiberboard base, this piece is very stylish. Keep many bathroom items in its roomy drawers and double-door cabinet. Put a classic feel in your bathroom with this good-looking set from Wyndham Collection. Amare 48-inch W 2-Drawer 2-Door Wall Mounted Vanity in Brown With Artificial Stone Top in White Enjoy the popular modern look in your bathroom with this beautiful vanity. The white artificial stone counter and brown fiberboard base make this piece great for any bathroom. The double-door cabinet and drawers are great for putting away bathroom items. Make your bathroom look like new with this good-looking, useful set from Wyndham Collection. 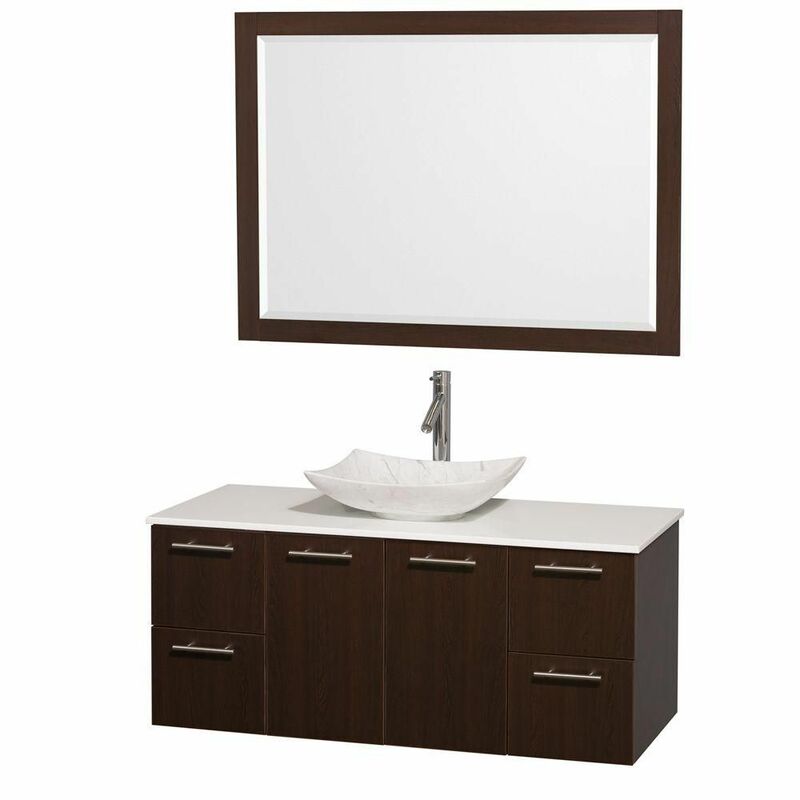 Amare 48-inch W 2-Drawer 2-Door Wall Mounted Vanity in Brown With Artificial Stone Top in White is rated 3.0 out of 5 by 1. Rated 3 out of 5 by Sasique from The sink basin marble has white specks ingrained in the... The sink basin marble has white specks ingrained in the marble. On the surface you would think these are white paint drops. As I try to clean and scrape them I found that these are marble defects and can not be removed.